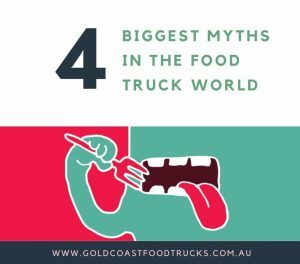 Here are 4 of the biggest myths in the food truck world. 1. Food trucks don’t have to pay rent so it’s not fair. False – Every market and food truck event will charge a fee (you can call it rent if you like). And that fee can amount to anywhere from 5 to 50% of the truck’s sales turnover depending on the day. Markets and events incur costs and those costs (plus their profits) are passed onto the trucks. Nothing is free anymore. 2. Food trucks don’t have any expenses! False – Food trucks have plenty of expenses and some are unique to mobile food service. Don’t let anyone convince you that because they are mobile they don’t have costs. Licence fees, Commercial prep kitchen rent, relatively high vehicle insurances, petrol, maintenance costs for truck and moving equipment, registration, staff wages….and it goes on. 3. Food trucks are unhygienic and dangerous. False – You want nuts and crazy with that!!!! The local authorities are extremely active in their inspection of food trucks and trailers. An average restaurant will be inspected around once or twice every three years where as, a food truck will be inspected at every major food truck event. That means a busy food truck will be inspected around 6-10 times a year! If something is not up to standard then they will be shut down and you wont see them. They are held to rigorous health standards, have undertaken health and safety courses and are participants in the local food star rating program. 4. Food Truck’s are run by amateurs and the food is substandard. False – As made famous by the cult classic movie, Chef many food trucks are operated by entrepreneurial chef’s eager to carve out a small business for themselves and move out of bricks and mortar establishments. And if not formally qualified, 100% of all food truck operators are passionate and skilled in what they do and it should be on show through that serving window. They have invested lots of their own money and have honed their recipes and skills to be able to showcase their pride and joy to everyone. If you cant taste that in their food, then you’re eating from the wrong truck amigo.